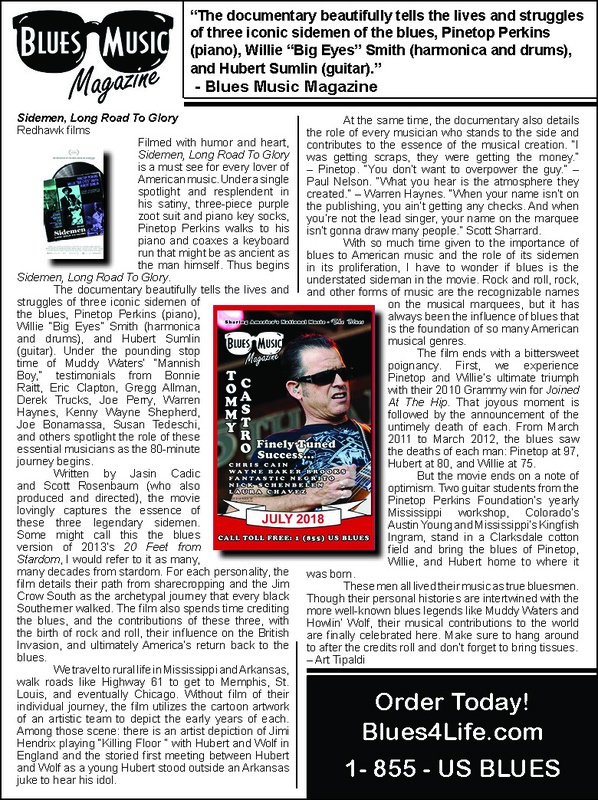 Sidemen: Long Road To Glory is an award-winning documentary film about the lives, legacies and music of bluesmen Hubert Sumlin, Pinetop Perkins and Willie "Big Eyes" Smith. The film is complete and has enjoyed a successful festival run since its world premiere at the 2016 SXSW Film Festival. VARIETY: Sidemen” is an exceptionally entertaining and captivating tribute to the men and their music — and that there’s more than enough of said music here to please blues aficionados and recruit converts. LA TIMES: It may have been a long road to glory, but seeing Perkins (then 97) and Smith (75) enthusiastically accept a 2011 Grammy for their album “Joined at the Hip,” it’s readily apparent that it was worth the trip. NY POST: The next time you hear a debate on who should be inducted into the Rock And Roll Hall of Fame, be sure to bring up the name of Hubert Sumlin. As pointed out in the new documentary “Sidemen: Long Road to Glory” (which opens Friday), the Delta blues guitarist isn’t a household name. But his dynamic playing is so revered that more than a dozen previous HOF inductees, including Eric Clapton, Elvis Costello, Keith Richards and Steve Winwood of Traffic, have petitioned the institution to induct Sumlin as one of the greats. NY TIMES: All rock ’n’ roll roads lead back to the blues. 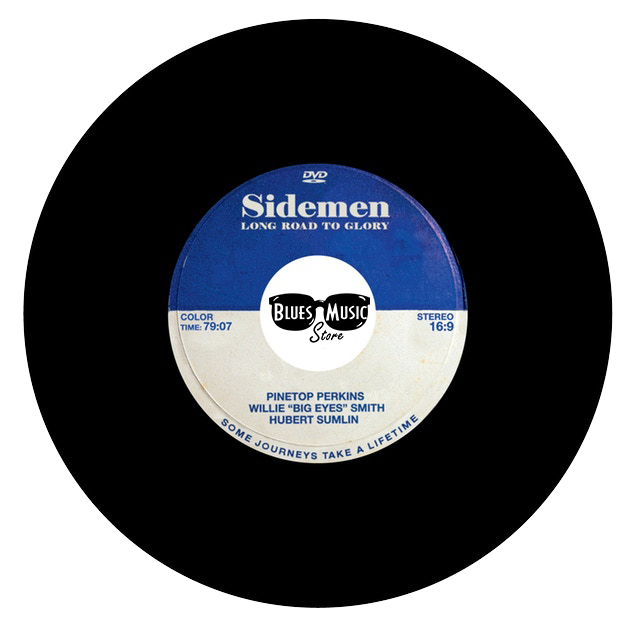 And if “Sidemen: Long Road to Glory” is to be believed, most of those highways converge on three bluesmen in particular: the drummer Willie Smith, the guitarist Hubert Sumlin and the pianist Joe Willie Perkins, known as Pinetop. As proof, a slew of sunken-eyed rock legends — including Johnny Winter, Gregg Allman, Keith Richards and Joe Perry — is on hand to share memories of the men and attest to their lasting influence. Their stories are inseparable from that of the blues itself, which the filmmakers illustrate with a wealth of clips and concert footage reaching back more than half a century. The kids who thrilled to the Rolling Stones performing “Little Red Rooster” (the first blues song to reach No. 1 on the British charts), or watched Jimi Hendrix kill “Killing Floor,” probably knew nothing of Wolf and Waters. They just knew what they liked. In the summer of 2008, a group of legendary bluesmen, some of the last surviving members of the Howlin’ Wolf and Muddy Waters bands, were brought together by director Scott Rosenbaum for a cameo appearance in his feature film, The Perfect Age of Rock ‘n’ Roll. Pinetop Perkins, Willie "Big Eyes" Smith and Hubert Sumlin were cast for their authenticity and ability to underscore the film’s critical subplot, the evolution of rock ‘n’ roll through the blues. During breaks in production, these bluesmen thrilled Rosenbaum with their tales of a lifetime spent on the road. First hand accounts of experiences with the mythical Robert Johnson, the larger-than-life Howlin’ Wolf, the seminal Muddy Waters and disciples such as Jimi Hendrix and The Rolling Stones got the director’s creative wheels spinning. Between takes, Sumlin called Rosenbaum over to the bandstand and prophetically told him of his feeling that they would be working together again. In an instant, an idea that had been germinating with the director for years took root. When the bluesmen’s booking agent, Hugh Southard approached Rosenbaum, asking him to lend the film’s name to help galvanize a world tour featuring these legendary musicians, a concept had fully blossomed. Having grown up on Martin Scorsese’s valediction to The Band, The Last Waltz, Rosenbaum wanted to make a film that similarly honored the life and musical legacy of these aging bluesmen. When Pinetop, Hubert and Willie "Big Eyes," along with Sugar Blue, Robert Stroger and Bob Margolin hit the road as The Perfect Age of Rock ‘n’ Roll Blues Band, Rosenbaum, along with producers Jasin Cadic, Tony Grazia, Joe White and Emmett James were determined to capture this important moment and fleeting history. Over the next three years they would follow these blues legends, shooting live performances, an historic Grammy win, dozens of intimate interviews, countless behind-the-scenes moments, and documenting their lives on the road. Sadly, the 2011 deaths of Willie, Pine and Hubert altered the film’s initial Last Waltz style vision; to capture these legends performing live versions of classic blues songs with the musicians they had so heavily influenced. Luckily, several of these performance pairings were filmed before their deaths. Those treasured moments are complimented by over two dozen subsequent interviews with some of blues and rock’s biggest names, demonstrating the true impact and tremendous respect that these men engendered over the course of their long careers. Members of The Doors, The Allman Brothers, The Paul Butterfield Blues Band, Aerosmith, The Dave Matthews Band, as well as artists like Bonnie Raitt, Johnny Winter, Bobby Rush and Shemekia Copeland share their personal and professional recollections of these men and the impact that they’ve had on their own careers. When asked how they hoped to be remembered, Willie, Pine and Hubert consistently expressed their wish to be known for both having kept the blues alive and to serve as an inspiration for the younger generations of musicians. Interviews with blues acolytes Joe Bonamassa, Eric Gales, Warren Haynes, Kenny Wayne Shepherd, and Derek Trucks affirm that their legacies are alive and well. Several of these musicians have even contributed searing on-camera solo performances in tribute to these late blues legends. Haunting imagery of the Mississippi Delta region, the birthplace of the blues and these legendary bluesmen, punctuates this powerful piece of history. This film succeeds in capturing the personal triumphs, tragedies and tremendous perseverance of three of the last original Delta and Chicago bluesmen while preserving a critical legacy that is nothing short of our last links to the origins of all popular music.